Gluten free diners are well looked after at Leura's Lily's Pad Cafe. If not already gluten free, most of the breakfast menu can be adapted to be so, including gluten free toast cooked on a separate grill. Most of the lunch menu can be made gluten free, and we are always happy to adapt the menu to meet other dietary needs. For the sweet tooths gluten free banana bread, pancakes, waffles and the very popular pear, apple, walnut and fig bread are made on the premises. In fact, most of the food is prepared at the cafe. 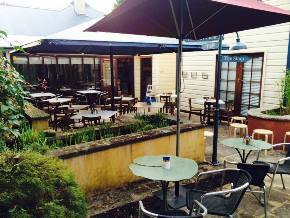 The cafe has a delightful setting, indicative of the Blue Mountains region. It's mostly an outdoor cafe, with a cosy indoor seating area. For the winter days there is an outdoor structure fitted with roll down sides and heaters that will keep you cosy while keeping an alfresco dining atmosphere. There's a substantial sandstone courtyard, various pond features, and coming soon will be an intriguing vertical herb garden. BYO alcohol permitted. Lily’s Pad can also provide outside catering specialising in gluten free finger foods, lunches and desserts. With a larger production kitchen opening in April 2015 there will be a higher volume and availability of gluten free products from Lily’s Pad Cafe.